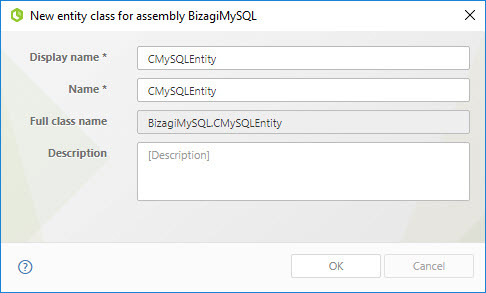 Bizagi provides a wizard to assist in connecting to an external sources such as SQL Server and Oracle (for data-level integration). For any data source other then SQL Server and Oracle, there is the possibility to override the methods and classes used by Bizagi in its Virtualization feature. 1. Creating a custom Virtualization library. 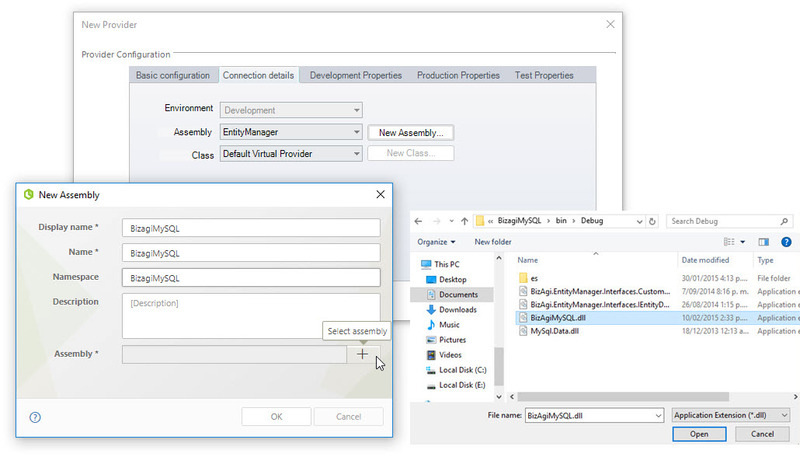 Within this custom library, you will need to override Bizagi Virtualization's classes and methods (as described in the next section: Classes and methods to override). 2. 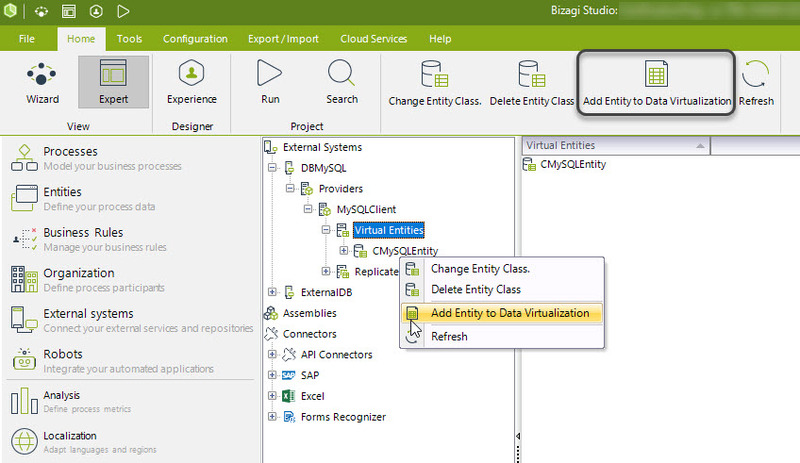 Configuring the data provider in Bizagi to use the custom Virtualization library. This configuration uses the Advanced Virtualization configuration in Bizagi. Bizagi separates the operations for connection, disconnection and transactional management from the operations to query data from the external sources in the Provider and Entity interfaces. Therefore, when creating a custom Virtualization library, Bizagi follows best practices for this management and implementation's design. •void Init (Dictionary<string, string> metadata): In charge of taking the data supplied in the system configuration, such as server name, database name, user, password, etc. It receives a Dictionary<string, string> map that contains the data configured as system metadata. •void OpenConnection(): This method is used to make the connection with the external system. In the case of a database, this is where you build the connection links and open a connection with the repository. •void CloseConnection(): In charge of closing the connection with the external system. •void BeginTransaction(): In charge of initiating a new transaction for the current operation in the system. •void Commit(): Commits the current transaction in the reference system. •void Rollback(): Carries out rollback of the current transaction in the reference system. •void AddParameter (string parameterName, BizagiDataType dataType, int size, byte precision, byte scale, object value, ParameterDirection parameterDirection): In charge of adding a parameter to the query to be executed. •void ClearParameters(): Removes the existing parameters in the query. •DataSet RunQuery(string query, string tableName): used to query the values of the external data source. The logic is generally equivalent to making a query on the fields of the data object. The class that implements this interface must contain the logic necessary to manipulate the virtualized data, such as inserting a new record, consulting within a group of records and updating and deleting a registry. •void Init(ICustomProviderDA provider): Initializes the connection with the system. Allows the conversion towards the object that implements the ICustomProviderDA interface. •DataSet GetEntityInstance(string entitySource, KeyColumn keyColumns, string columnList): Takes data from entity instances (values) from the corresponding table for a specific ID. Table where the entity is implemented. Array that contains the names of the columns used to filter the record. Array that contains the name of the columns to be consulted. A DataSet with the values for that entity. Table where the entity is located. Array of columns used as keys. Columns to be included on the list. Filter to be applied in search of entities in the WHERE clause. True if the information from the schema is to be returned from the database, False otherwise. Number of registers to be returned. Column of values to return. Array of columns used as key. True if the instance was found, False otherwise. Column used to find the instance. Should return "1" if the instance was found. Returns "0" if not. List of columns to add to values. Should return a List of EntityOutputColumn that contains the name of the column paired with the value that was inserted. 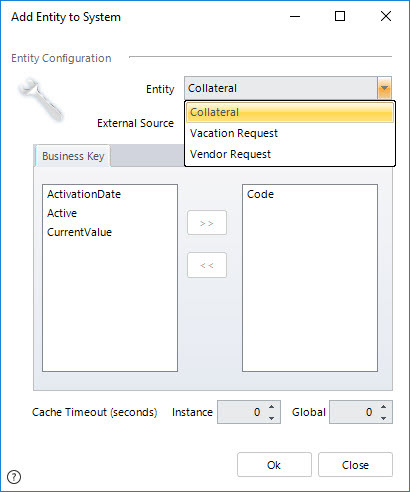 •EntityOutputColumn UpdateEntity(string entSource, EntityColumn updateColumns, KeyColumn keyColumns, EntityAutoColumn autoColumns): Updates the data of an instance of the entity (values) in the database and records the update. Array of columns to update. Should return an Array of EntityOutputColumn that contains the name of the column and the value that was inserted. •bool DeleteEntity(string entSource, KeyColumn keyColumns): Deletes a record from the database. Should return True if the record was deleted, False otherwise. Keep in mind Bizagi will build the query and its syntax. According to this idea, make sure you define all the proper constants to be used in queries in the integrated Database engine. 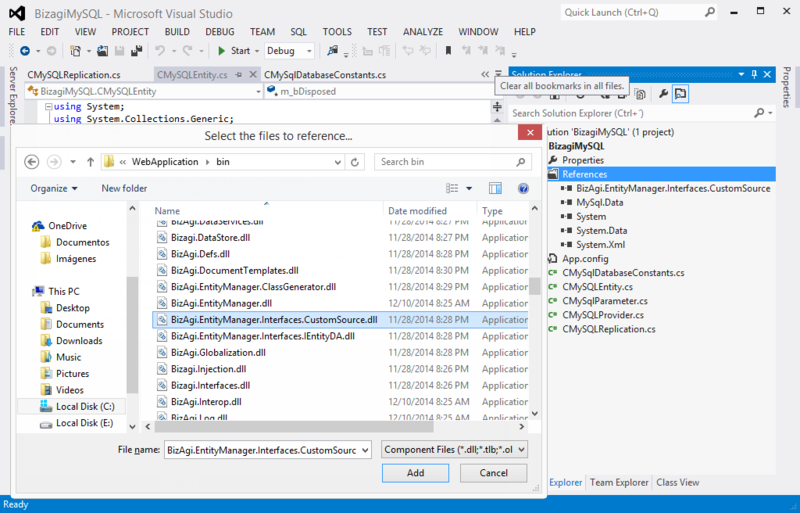 In this example, we will configure custom Virtualization for a MySQL database engine. We will present an example of the Virtualization classes that implement the "ICustomProviderDA", "ICustomQueryDA" and "IEntityVirtualDA" interfaces. Take into account that the following code provides an illustration for the "AddEntity()" method implementation (to serve as a guide), but other methods are not included and would need further development. 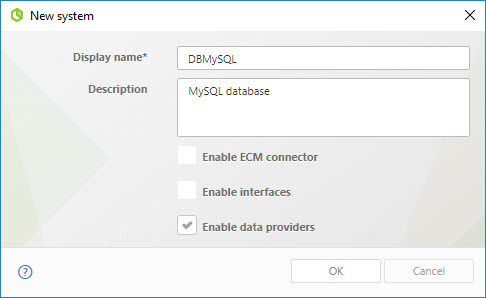 In this specific example, in order to implement Virtualization classes that connect to a MySQL database, it is required to first download and install the MySQL Connector/NET component for that connection. The following classes were developed with Microsoft Visual Studio. 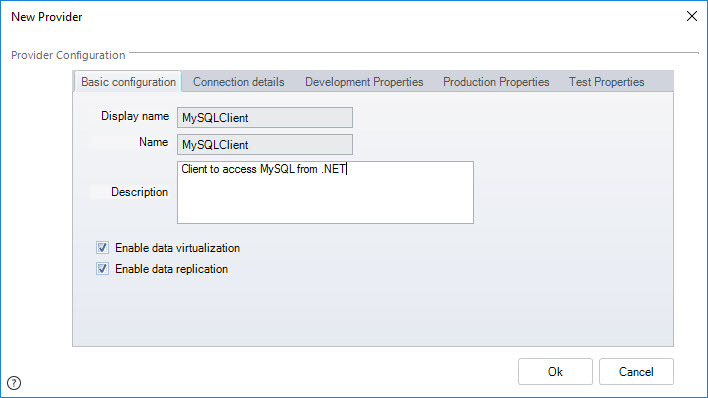 Within this .NET project, referencing the "MySql.Data.dll" assembly as installed by the MySQL Connector/Net component is required. It is also necessary to reference the library BizAgi.EntityManager.Interfaces.CustomSource.dll of Bizagi. This is found at the bin of the project's web application folder (by default at "C:\Bizagi\Projects\[PROJECT_NAME]\WebApplication\bin\"). Once the implementation for these classes is done, build your component as a class library (for this example, as a dll assembly). 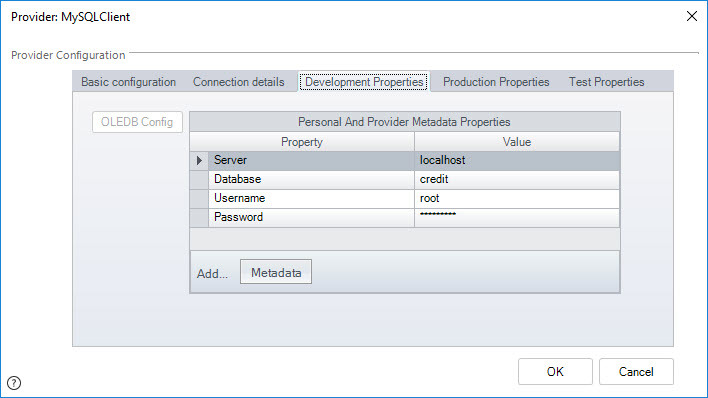 In this step, configure the System and data provider for Virtualization; by specifying which library will be used (the custom component we created previously). Take into account that this configuration is done through the Advanced Virtualization method, which requires that the entities to virtualize are already created in Bizagi's data model. 1. Click External Systems in the Expert View of Bizagi. Then either right-click the Systems element and select New System from the drop-down menu, or click directly on New System in the standard menu bar. 2. Enter a Name, Display name and Description for the new system and tick the Enable Virtual Entities and Replication for this System checkbox. 3. Click the plus sign (+) beside the newly created system. Right-click the New Provider option. 4. In the New Provider window enter a Name, Display name and Description in the Basic configuration tab. Check the Enable Virtual Entities for this Provider option. Also check Enable Replication for this Provider (if it applies). 5. Select the Connection details tab and click New Assembly. 6. Enter a Name, Display name, Namespace and Description. Then click Select Assembly to select the .dll of the custom virtual library previously built. Click OK in the New Assembly window. 7. 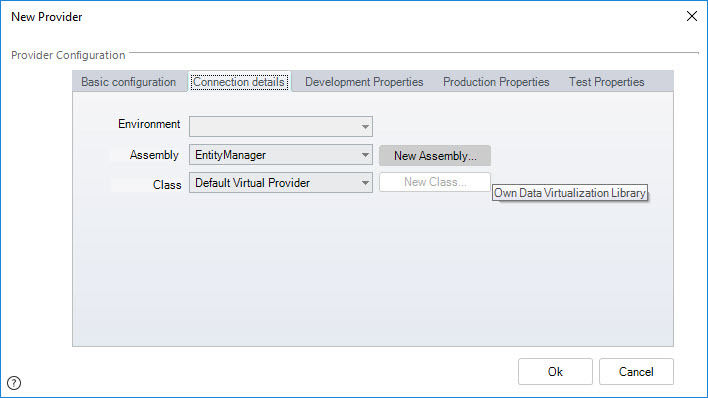 Click the New Class button and in the New Class for Assembly window, enter the name of the class that implements the IProviderVirtualDA interface. 8. Now in the Development Properties tab, include the connection properties by clicking the Metadata button to create a new Property-Value paired row. 9. 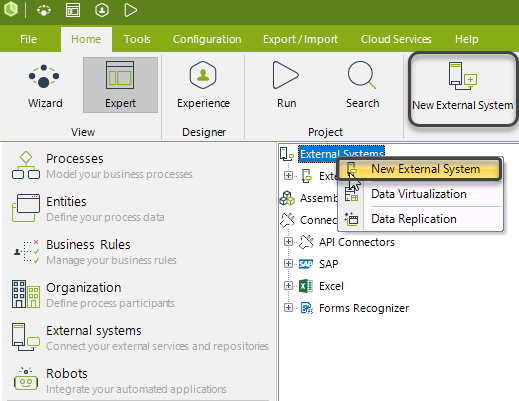 Expand the new provider element, select the Virtual Entities element and create a New Dat Virtualization Class. 10. 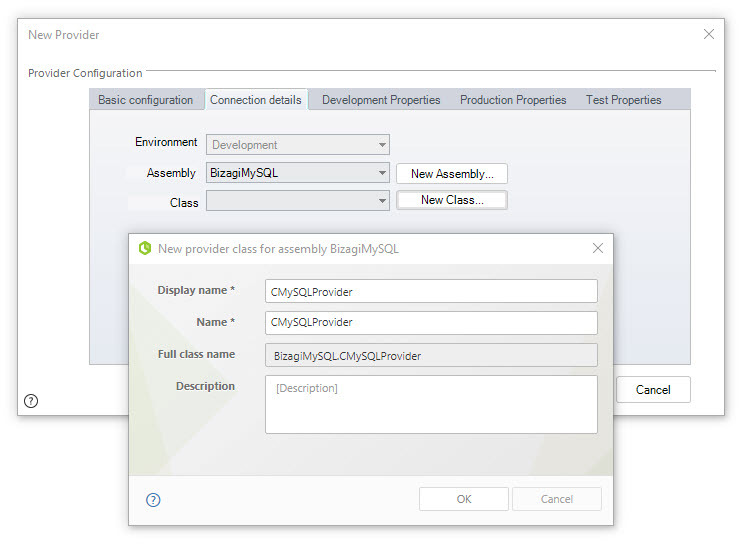 Select the assembly from the drop-down list in the New Class for assembly window (if the Entity class is in the same assembly as the Provider class) or include a new one by clicking on New Assembly. Click New Class and complete the necessary fields in the new window. Click OK to complete the Entity Class Configuration. 11. Right-click the new entity class element and select the Add Entity to Virtual option. 12. 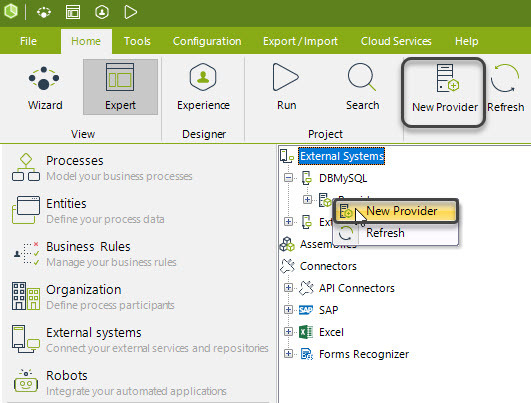 In the Add Entity to System window, first select from the Master entities drop-down list the desired entity. Then, in the External Source field, enter the name for the source's table or view. Next, select one (or more) from the list of attributes of the Bizagi entity, to be the business key (an attribute that will have a unique value so that it can be used to differentiate one record from another). Click OK to save this changes. 13. Select the virtual entity and for each attribute select the corresponding external attribute. This is done by right-clicking the attribute and selecting Properties. 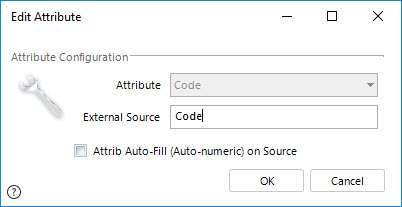 In the Edit Attribute window, enter the external attribute name and click OK. If your custom Virtualization library has references to other assemblies it is necessary to copy these assemblies: to the Bizagi Studio folder, (by default at: "C:\Program Files\Bizagi\Bizagi Standard\Studio"), and into the bin of the web application folder (by default: at "C:\Bizagi\Projects\[PROJECT_NAME]\WebApplication\bin"). The latter is done so that Virtualization works in run-time.